It’s been a while since I posted part I, and not because I haven’t been working on this (quite the contrary), but because I prefer to take a bit more time and be completely happy with the results, than just putting something together for the sake of doing so. A while ago I came back from the post office with a few precious items I ordered from one of the beautiful shops you can find on Etsy. I truly love that wonderful world of crafty and creative people selling their work there. Antonia Truesdale runs a beautiful shop of clay sculptures that she has been creating throughout her own bumpy road through life. She sells many loss sculptures that may bring healing to your heart. I’ve displayed mine around the house, and every time I look at one of them, it softens the pain I feel just a little bit. I chose one that displays a mother holding her angel baby girl in her hands, just like I held my baby girl the day she was born and gone at the same time. It reminds me of her in a beautiful, peaceful and comforting way, which is a beautiful thing. 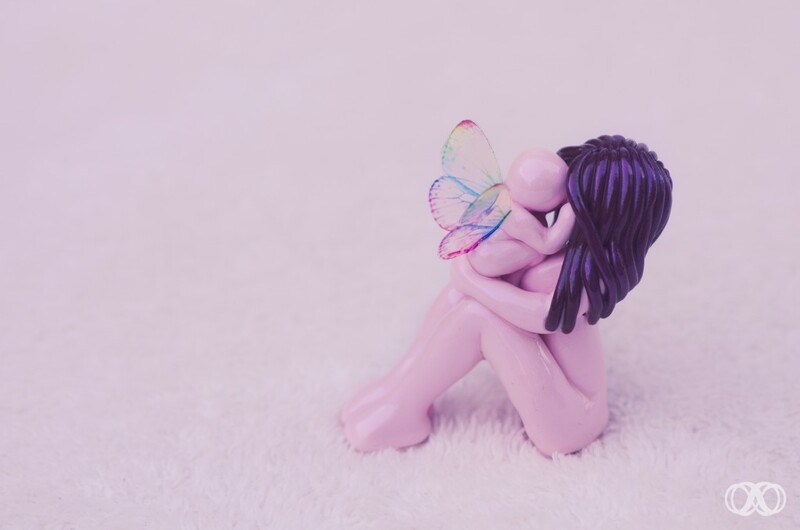 It reminds me of that precious, short moment, that my heart was filled but nothing but happiness and bliss, looking at her beautiful face, touching her cute little hands, and holding her tight to my chest. I keep this sculpture in my living room, so I also wanted one to keep close to me in my bedroom. To see it when I wake up, and every time I go to sleep. Although I really really love this sculpture, I didn’t want to have an exact replica of it in my bedroom, and since there’s plenty of choice, I chose one that represents my baby Sahar, living a beautiful life in Heaven, sending me messages to let me know that she is okay and thinks of me too (the one on top of the page). When sadness clouds my heart, this always makes me feel better. “Go tell mommy I’m okay”. 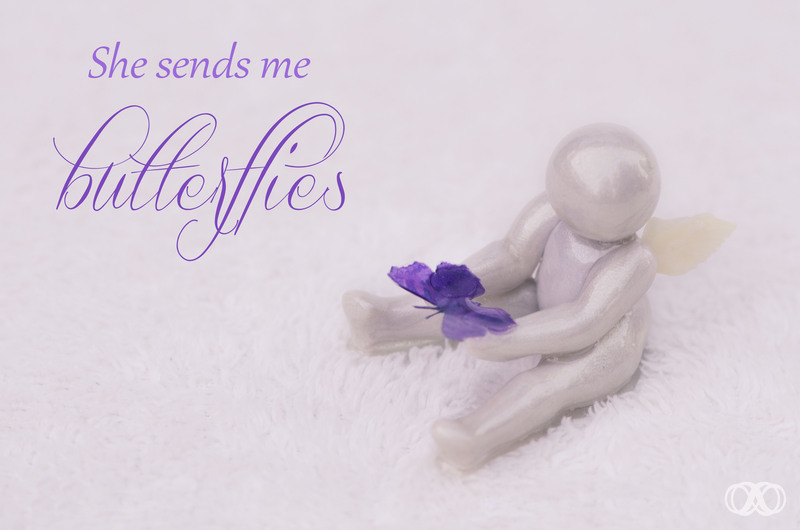 It has a very special meaning for me as I truly do believe that she sends me messages and signs, through butterflies and other miracles of nature. It’s not always easy to remember the good things when your heart is so filled with sadness and grief from the terrible loss you’ve suffered. Still, it’s very important to do so. Because our children are blessings, even if they couldn’t stay. I try to remember Sahar in a beautiful way, whenever I can. I try to le the sun shine through that cloud of grief, and be grateful for the time I got to spend with her. This is why I try to create a place of beauty, healing and hope to remember her.